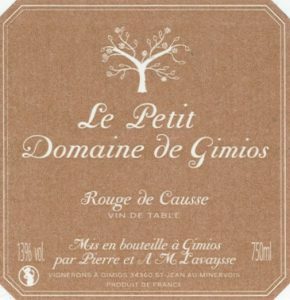 For a real treat we have managed to source some of the delicious wines of Anne-Marie and Pierre Lavaysse from Saint Jean de Minervois in the Herault in the Languedoc (actually they are from the hameau of Gimios within the commune borders of Saint Jean de Minervois). 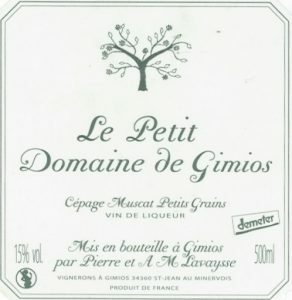 Their self-deprecating domaine name is Le Petit Domain de Gimios.Anne-Marie established the domaine in 1993 and immediately started to restore the abandoned, very old vineyards of which she was now the custodian. She tends her vines using biodynamic practices and the domaine is certified biodynamic by Ecocert.Saint Jean de Minervois is famous for the production of sweet and dry white wines made from the Muscat grape variety. 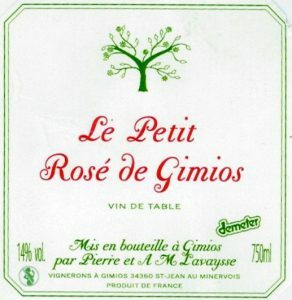 The Gimios wines are sourced from incredibly low-yielding vines (down to 8 hectolitres per hectare) hence they tend to be a bit more expensive than some but they are very, very delicious. The dry wines are not completely dry – they have a lovely wisp of sugar at the end which is very appealing. The sweet wines are quite luscious and show just what a great grape this is in the hands of a good winemaker. As an added bonus these wines have had absolutely no sulphur added and haven’t had since 2002. This wine is unlike any other Muscat you are likely to have tried. The Lavaysse family add nothing to their wine to change the essential characteristics of the Muscat a Petit Grains grape variety. As such they produce a wine of great interest and complex characters. The grapes are harvested from old vines that produce exceptionally low yields therefore the flavour is quite concentrated in the grapes that are harvested. Even though it has the Sec designation indicating that it is a dry wine, there is still a little residual sugar in the 2011 vintage adding interest and a beautiful finish. This is an intriguing wine! We are lucky to have small quantities of a number of back vintages. Every one is different and it makes for a special line up. This is a sweet white wine with an intriguing palate. Made from the same plot as the Muscat Sec this wines is truly special. It has character, charm, intrigue, lingering sweetness, length, complexity and much more. We were only allocated a tiny amount so it is first in best dressed! This wine is made from at least the following red grapes Cinsault, Alicante, Grenache, Carignan and Aramon, and the white grape Muscat a Petit Grains. This rose this year is a very robust pink that opens slowly in the glass but lingers on the palate for a long time. We love the mouth feel and we love the layers of interest contributed by the Carignan which thrives in this region and the very rare, native Aramon which is rarely found in wines these days. This is an amazing wine! The grapes come from an exposed, rocky vineyard covered with low bush vines with thick trunks that help them stand up to the wind that pushes down from the mountains behind. No wires tame the vines because Anne-Marie likes to walk through the vineyard as she chooses. There are at least sixteen different grape varieties planted in this place. But they are randomly planted. There might be a Carignan vine and then two Cinsault vines, followed by an Aramon and then a couple of Grenache. And the vineyard also contains Oeillade, Terret Rose, Terret Noir, Terret Blanc, Syrah, Muscat and Alicante. The grapes are co-fermented to produce this amazing soft, round, subtle red with layers that seems to go on forever. This wine is named after the terroir on which the vines thrive! The grapes come from an exposed, rocky vineyard covered with low bush vines with thick trunks that help them stand up to the wind that pushes down from the mountains behind. No wires tame the vines because Anne-Marie likes to walk through the vineyard as she chooses. 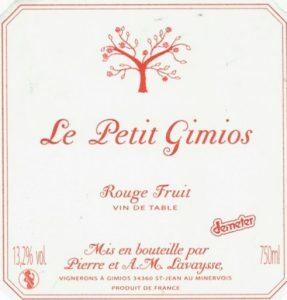 In 2013 approximately 30% of the grapes that made this unique wine were of the Carignan variety. Once again this wine is made from the Muscat a Petit Grains grape variety started in a very similar way to the Sec des Roumanis but the fermentation has been stopped by the addition of alcohol in the tradition of wines such as Muscat de Beaumes de Venise or Muscat de Rivesaltes. The end result is a delicious, sweet wine of incredible complexity that lasts for ages after it has been opened and is perfect for the restaurant trade for something very different to offer guests to pair with desserts. It is also perfect for retail customers who want a drink they can keep in the fridge and dip into from time to time.